Why make soap? Why bother? You can buy something to wash with for a tenth the price. I ask myself this every time I make another batch. It's a fascination, a sort of alchemy. I have a hard time limiting myself to making just enough for my own use and for gifts. Since I didn't like being in the soap business, I control myself, more or less. People believe a lot of weird things about soapmaking. That it's expensive and difficult. That it's dangerous--well, it's true that soapmaking is about as dangerous as frying chicken. That doesn't put it very high on the fear scale, as far as I'm concerned. The myths just go on from there. In extreme cases, people believe soap has to be stirred clockwise or with a sassafras stick. Or that it only works in certain moon phases. At this point, we're verging on witchcraft, which is not exactly known for producing soap. I tried to debunk as many myths as possible in my book, Smart Soapmaking. The thing about soapmaking is, you never know it all. Every experiment answers one question and poses two more. At a certain point, I realized I'd never reach the end. In the interest of getting the book written, I set the experiments aside. Now that the book is finished, I plan to use this page to describe things I'm wondering about and trying--loose ends and new techniques. Use my contact form if you'd like to comment on any of my thoughts or air ideas of your own. I'm always trying something new, so I'm keeping an experiment diary. I hope it will be useful. Also, I've recently learned that all stick blenders are not created equal. I had an OK one, and the switch broke. Since I was in the middle of experimenting for the book and didn't have time to price-shop, I bought a new one that seemed a bit overpriced. Once I started making soap with it, I realized it was worth every penny--it makes soap much more efficiently than the old one did. So I'm asking for opinions on stick blenders you've used--the good, the bad and the ugly. Use the contact form, and I'll post your experiences on the Stick Blender Review page. Another link in the boxes below accesses the names, addresses, and web sites of all the soapmaking materials suppliers I could find. They're arranged by location. If you know of one I haven't listed, please let me know! New--A directory of soapmaking teachers. I'm just getting started with this. If you teach soapmaking, please use the contact form on this web site to be added to the list. I get a lot of questions from readers about this. 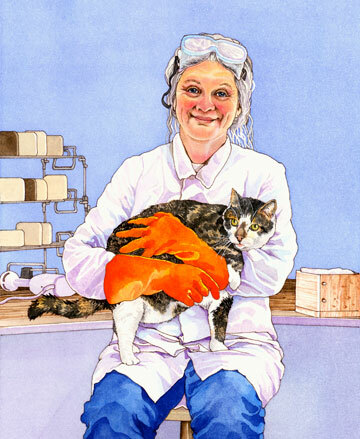 The picture of me in my soapmaking duds, complete with cat who is NOT a soapmaker, was painted by Wendy Edelson. Here's an assortment of helpful links.